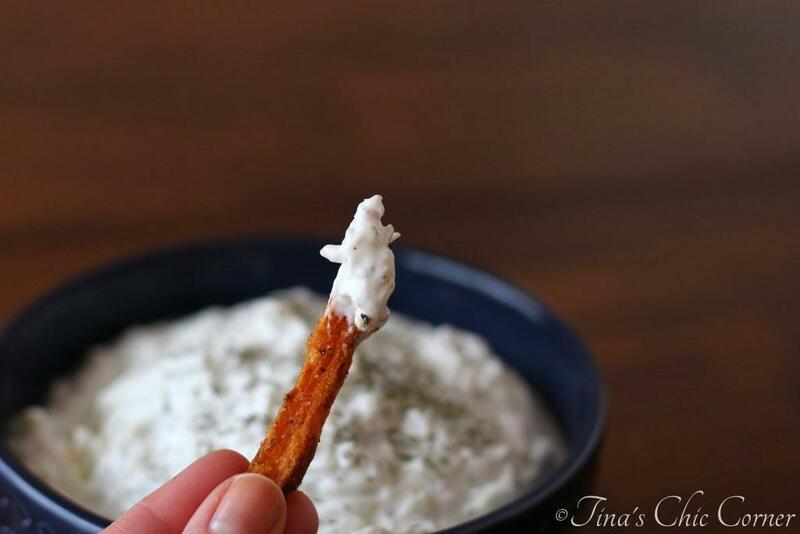 Making one appetizer is usually pretty easy to do. Making piles of appetizers and pretending it was an easy way to make a complete meal is a great way to be surprised by how much work they can be to make. I think they start out innocent enough, but for some reason when you are making multiple kinds the difficulty seems to multiply instead of merely add. 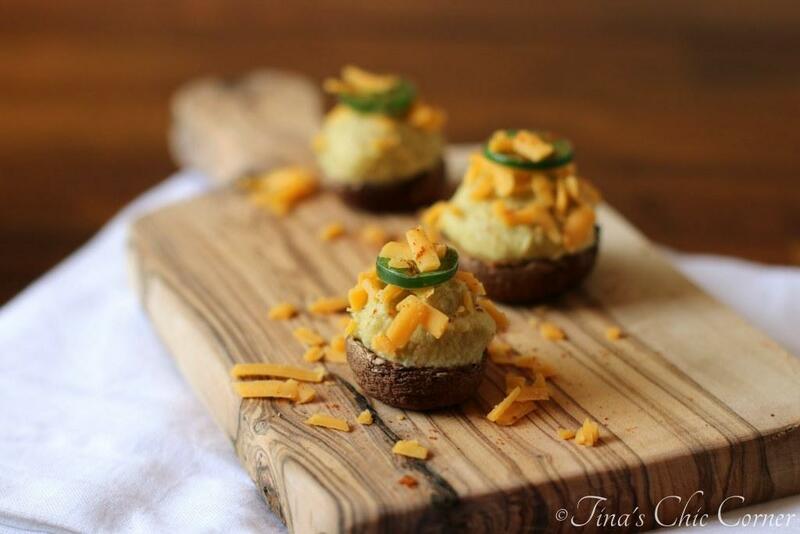 These bite sized mushrooms are stuffed with a jalapeno hummus and covered in cheddar cheese. In a food processor, blend together the chick peas, garlic, jalapeno, lemon juice, olive oil, cayenne pepper, salt, and pepper, until it’s well combined and smooth. Lay tin foil onto a baking sheet and set it aside. Break the stems out of the caps of the mushrooms and discard them. 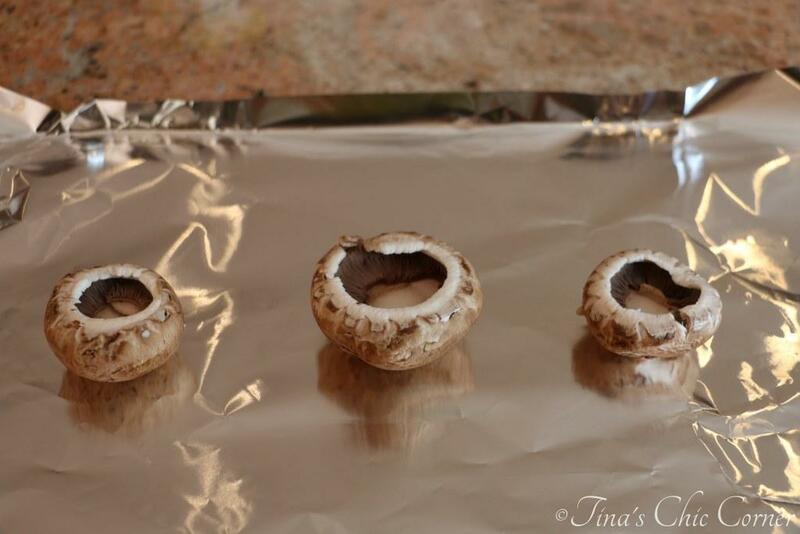 Carefully empty the liquid from the mushrooms (be careful, they are hot right out of the oven) and then let them cool. 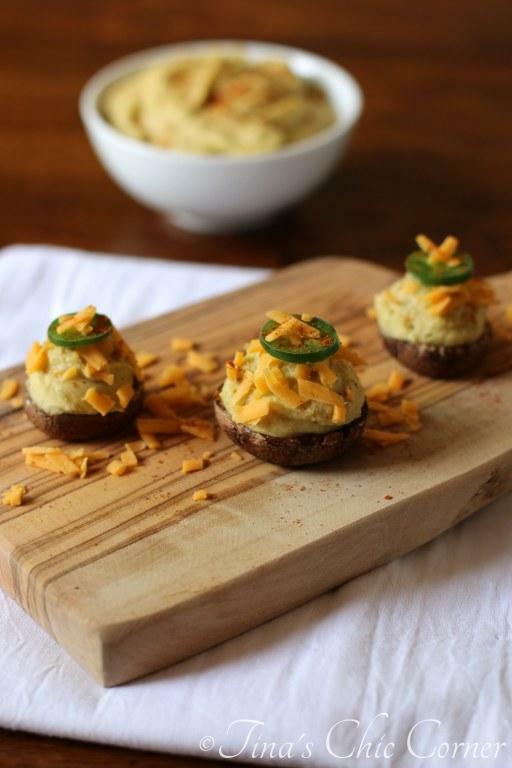 Fill each mushroom cap with jalapeno hummus. Sprinkle shredded cheddar cheese on top of the hummus. (Optional) Garnish the top with a slice of fresh jalapeno and a sprinkle of cayenne pepper. Note that while this does make the appetizer prettier, it will also make it spicier. When I’m hosting a party, I try to get as much done the day before as possible so I’m not running around like a crazy lady the day of. Unfortunately, no matter how much I prepare the day before, I’m pretty much still a crazy lady the day of the party. 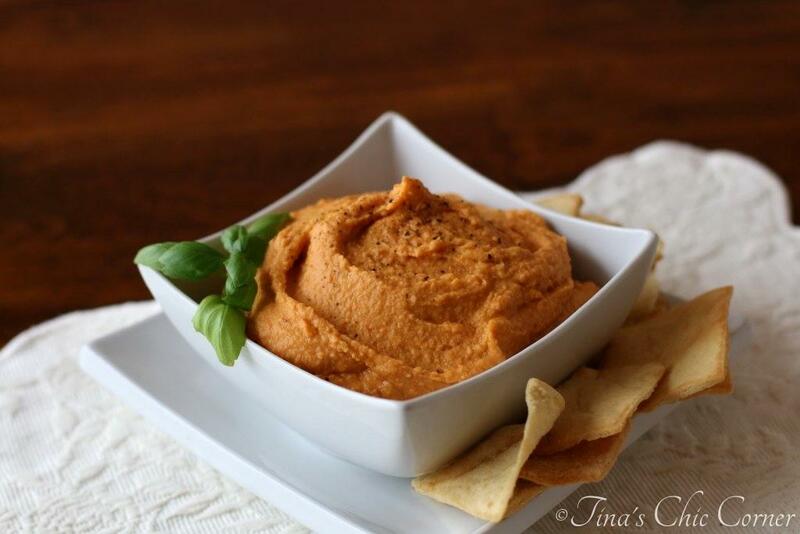 😉 This appetizer is a great make-ahead recipe because it’s meant to be enjoyed cold or at room temperature and hummus flavors seem to marry together nicely overnight. I baked the mushrooms to give them that roasty veggie essence. Since it’s grilling season, feel free to grill them instead if you like. One jalapeno and a touch of cayenne pepper makes this party mildly spicy. Since I was catering to a crowd, I wanted to keep the spice levels at a respectable level. If you like it really spicy, of course add more jalapeno, cayenne pepper or both to your liking. Adding cheese to this party was a no brainer for me. I mean, it’s cheese. Hello, it goes with everything. Warning, warning… get your stuffed mushroom as soon as you put them out. These were gone in a flash. Seriously, I plated them, performed a few quick hostess duties, and turned around to an almost empty plate. Rave reviews and vanishing food. My kind of party. 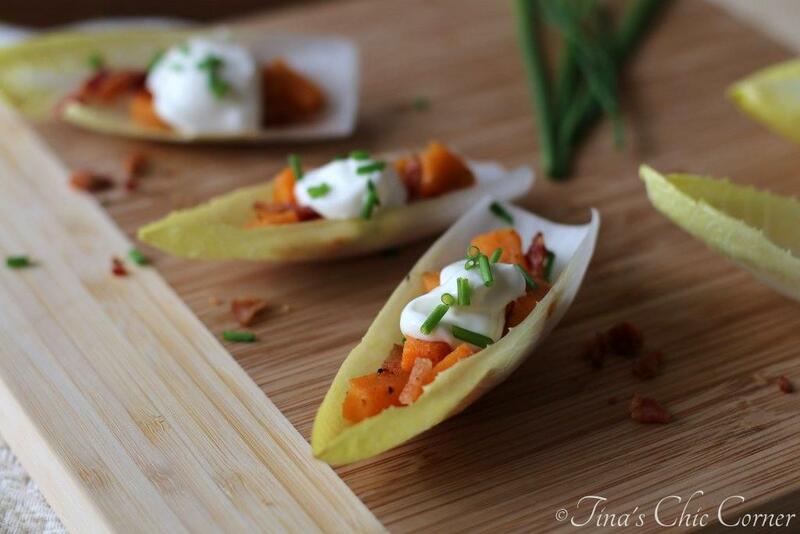 Here are some other amazing appetizers. I love stuffed mushrooms and I really like the lighting in this pic. What a great appetizer!! 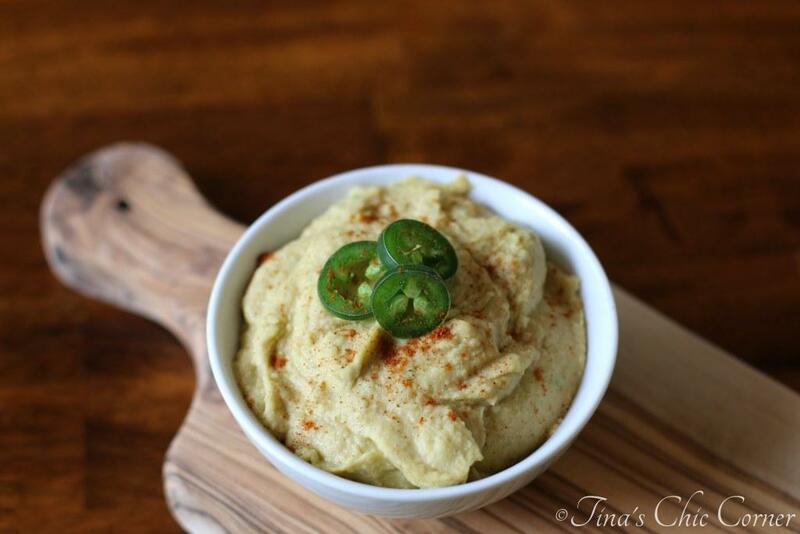 I love mushrooms and I love hummus – such a great idea to put them together. Love mushrooms and hot peppers. A nice change from breadcrumbs. I can’t wait to try these. These bites are beautiful Tina! I never would have thought of this super creative idea! LOVE IT! 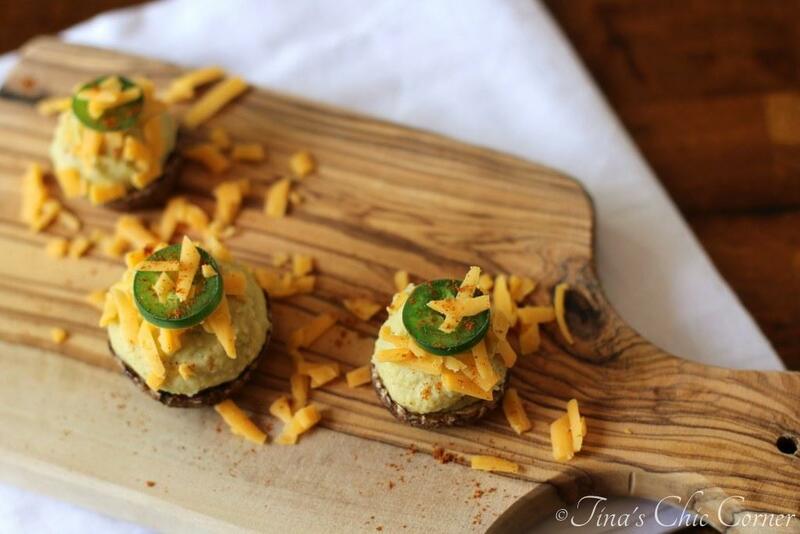 Can’t wait to have an appetizer party so I can try these 🙂 Pinning! 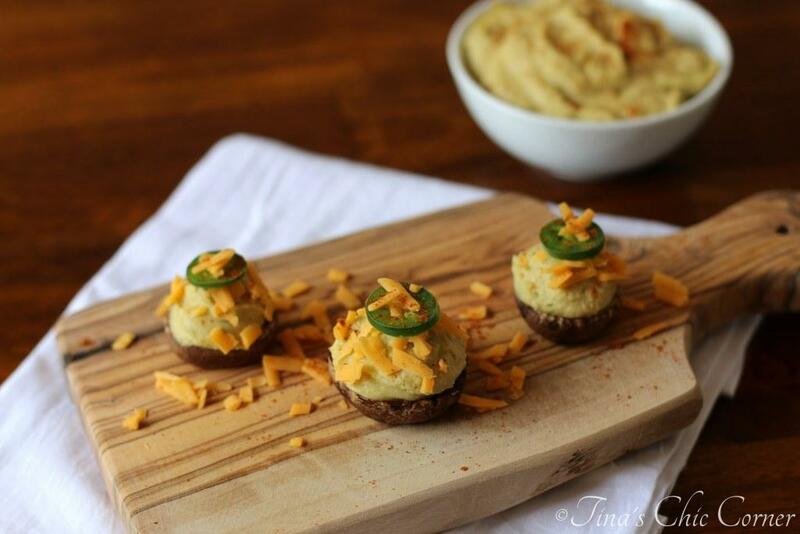 I am a HUGE fan of stuffed mushrooms but would have never thought to use hummus in them! And you’re right, stuffed mushrooms disappear so fast at parties – sometimes I like to keep a secret stash for myself later : ) haha so bad! Hehe…secret stash…love it! I’ll have to remember that next time. Make ahead apps! – that’s the way to go. Really different and wonderful flavor combo as well! Ah, I know all too well about he frantic crazy person running around getting ready. I never understand why, I clean and prep the day before but still there always seems to be a million things to get done. These stuffed mushrooms look amazing! Yes! That is SO me!! Another terrific recipe Tina! I love this idea. Pinned! These look amazing Tina! They look delicious tasting and are fancy too! I love it!